From the very top of the Smokies at Clingmans Dome, Sharon McCarthy (aka “Smoky Scout”) surveys the mountains that have become very familiar to her over the past year. She’s in the process of hiking all 900 miles of trails in the Great Smoky Mountains National Park to raise money for the Girl Scouts in North Carolina. 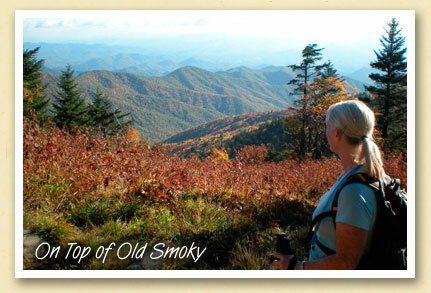 Sharon anticipates that her final hike will be the Old Sugarlands Trail near the Sugarlands Visitor Center on April 11. Including the additional miles she’s walked to access each of the trails, she will have hiked more than 1000 miles altogether. It’s a feat that will reward her with membership in the elite 900 Miler Club, a group that has added just 250 hikers since its founding in 1995. You can read Sharon’s journal on her blog “Great Smoky Mountains Girl Scout Challenge“. And while there, why not support the Girl Scouts with an online contribution?